Master Dunphy has studied martial arts for over 25 years and continues to study under the guidance of Grandmaster Huang Chien-Liang, the only full 64TH heir to the Tien Shan Pai system. Master Dunphy was the 1981 National Champion in kung fu forms and weapons and National Grand Champion in kung fu forms and weapons. In the Republic of China in 1986, he won the World Championship in Kuoshu (full-contact fighting). It was at this prestigious tournament that the only American champion earned the first place gold medal and the nickname “Iron Fist Dunphy” for his consistent early first round knockouts. 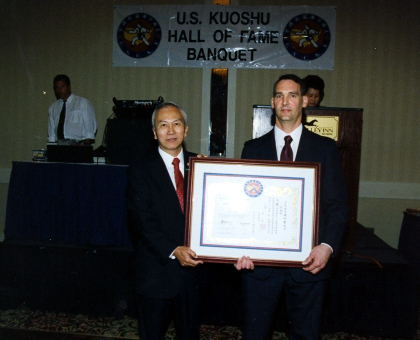 Joe Dunphy is inducted into the Kuoshu Hall of Fame at the 2001 U.S.C.K.F. International Championships. that aid one in producing both vitality for a long and healthy life and spirit for a tranquil and happy demeanor. By virtue of studying internal martial arts for more than 25 years, under the direct guidance of Grandmaster Huang, he is able to pass on the philosophy, detail and wisdom of the Chinese Martial Arts in a format to westerners that is easy for them to grasp and absorb. Master Dunphy has successfully gone through the traditional style of rigorous training, which included training seven days a week for an extended period of time, the famous iron palm training, hitting the wooden pole as well as learning various animal styles of kung fu such as the monkey, praying mantis and crane as well as ground style, drunken style boxing and Sun Bin. Master Dunphy has been featured on national television, has performed and demonstrated in front of large audiences in China and Taiwan and has been on television and in newspaper articles in those countries as well as in America. He has written articles and collaborated on training videos of different aspects of Martial Arts as well as having been selected as one of the top 100 most influential martial artists of this century by Inside Kung Fu magazine. He has been actively involved in one of the top martial arts tournaments in the world (USCKF International Kuoshu Tournament), is a world certified judge (A level), chief judge and tournament director of kuoshu competitions and is a high ranking official of the United States Chinese Kuoshu Federation and a board member of the World Kuoshu Federation. He has been inducted into several martial arts’ halls of fame and most recently was awarded the Pinnacle award at the Eastern United States Martial Arts Hall of Fame and had his name, picture and martial arts biography enshrined onto the wall of the USCKF Hall of Fame building in San Francisco, Ca. A Sixth-Degree Black Sash in Tien Shan Pai and a USCKF Certified Sixth Degree, Master Dunphy is currently the highest ranked master in the Tien Shan Pai system of Chinese Martial Arts, under Grandmaster Huang. He is well known for his ability to train his students to be successful in life as well as in all facets of tournament competition and in practical self defense training. Master Dunphy has produced world class champions in Kuoshu full contact fighting, light-contact sparring, forms, and weapons, tai chi forms and push hands. He has also trained students to a high level in hsing-I, pa kua, chi gung, nei kung and different types of meditations, as well as guiding and developing a large number of his youthful students to graduate high school and college with honors and achieve successes later on in their lives. At the 2004 USCKF International tournament, three of his students were awarded competitor of the year awards.